(Nanowerk News) The pistons in your car engine rub up against their cylinder walls thousands of times a minute; without lubrication in the form of motor oil, they and other parts of the engine would quickly wear away, causing engine failure. Motor oil contains chemical additives that extend how long engines can run without failure, but, despite decades of ubiquity, how such additives actually work to prevent this damage have remained a mystery. Now, engineers from the University of Pennsylvania and ExxonMobil have teamed up to answer this question. With a vested interest in the chemistry and performance of lubricants, scientists at ExxonMobil worked with scientists at Penn whose research focuses on nanoscale measurements of friction and lubrication. The team conducted research to probe nanoscale properties and mechanisms of lubricant films and ultimately uncovered the molecular mechanisms behind a common anti-wear additive. The study was led by Robert Carpick, chair of the Department of Mechanical Engineering and Applied Mechanics in Penn's School of Engineering and Applied Science, and Nitya Gosvami, a research project manager in his lab. Jason Bares and Filippo Mangolini, contributed to the study while members of Carpick's lab. They collaborated with two researchers at Corporate Strategic Research, ExxonMobil Research and Engineering Company: Dalia Yablon, currently with SurfaceChar LLC, and Andrew Konicek. Their paper, "Mechanisms of Antiwear Tribofilm Growth Revealed In Situ by Single-Asperity Sliding Contacts", appears in the journal Science, published online ahead of print on March 12. The anti-wear additive zinc dialkyldithiophosphate, or ZDDP, was essentially discovered by accident in the 1940s. Originally added to prevent rusting, engineers found it increased the anti-wear properties of motor oil by some then-unknown mechanism. As analysis techniques improved, researchers discovered that ZDDP breaks down and turns into a "tribofilm," a thin, solid layer that adheres to the surfaces in contact and further protects them from wear. The exact process by which ZDDP makes this transformation, however, remained unclear. "ZDDP has been used for more than 70 years," Gosvami said. "It's one of the most successful antiwear additives we have, but we still don't understand how it works. We do know that everything that happens during sliding is occurring on the first few atomic layers of the surfaces, so we have to use the knowledge we have from nanotechnology and apply it to understand what's going on there." Researchers would like to find molecules to reduce or replace ZDDP altogether, because, although it reduces wear, it slightly increases friction in the engine. It can also generate byproducts in the exhaust that reduce the lifespan and efficiency of a car's pollutant-reducing catalytic converter. Additionally, ZDDP does not work as well on the lightweight engine materials eyed as potential replacements for steels. "Our overall motivation is to make engines more efficient and sustainable," Carpick said. "Considering the massive use of vehicles, a small gain in efficiency has a big impact in saving energy and reducing carbon emissions annually." The surfaces of a piston and cylinder in a car engine may look perfectly smooth to the naked eye, but, zoomed into the nanometer scale, they might look more like mountain ranges. Absent a buffering layer of a protective film, those peaks, known as asperities, would rub against each other and quickly wear down due to very high local stresses through direct steel-on-steel contacts. The resulting debris can further increase the friction between the surfaces and can cause severe abrasion, causing the system to catastrophically fail prematurely. 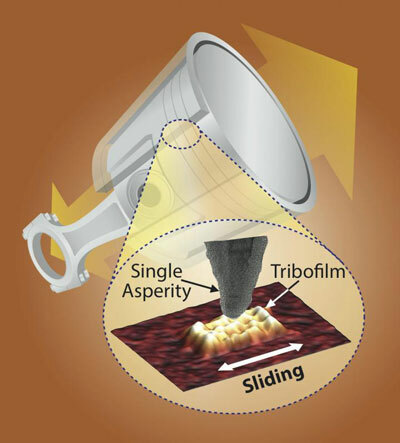 To see how the dynamics of this kind of sliding contributed to tribofilm growth, the researchers used the tip of an atomic force microscope to stand in for an individual point of roughness on those surfaces. An atomic force microscope uses a nanoscale tip much like a record needle. Mounted on a flexible arm, or cantilever, the microscope measures the up-and-down movement of the arm as the tip is dragged over a surface, generating a topographical picture with nearly atomic resolution. In their experiment, the researcher immersed the entire cantilever-tip apparatus in ZDDP-infused oil, simulating the environment surrounding a single asperity on a piston surface. They then slid the tip over an iron surface, which simulated the ferrous composition of engine parts and recorded what happened as the tribofilm formed. "The surface of a real engine component will have millions of asperities," Gosvami said, "but, if we can understand what is happening to one of them, we can pinpoint the underlying physical mechanism and scale up that understanding. Limiting it to a single point allows us to control the parameters, like contact stress and geometry, and once we do our in situ sliding test, we can use the AFM to get an image of the area." They found that films only began to form when the tip was slid at a certain pressure. This "stress activated" process meant that, the harder the tip squeezed and sheared the ZDDP-containing oil between the tip and sample, the faster the films grew. The researchers also found an explanation to why these films grow to a certain thickness and then stop growing. "It's essentially a 'cushion effect,'" Carpick said. "The film that grows is not as stiff as the steel. When you push on a stiff surface, you get a high stress due to the concentration of force. When you push on a less stiff surface, the force is spread out, so the stress is lower. The thicker the film, the more it acts as a cushion to reduce the stress that is needed to cause the chemical reactions needed to keep growing. It's self-limiting, or in other words, it has a way of cutting off its own growth". The self-limiting nature of the films is beneficial, as they would otherwise quickly use up the small amount of ZDDP in the oil. "The tribofilm knows when to stop itself from growing," said Mangolini. "That's one reason it's known as a 'smart material." Such a discovery would not have been possible without the team's nanoscale approach. Without being able to control the stress and geometry of a single point of contact and observe the film growth at the same time, there would be no way to connect the pressure threshold with the point at which the film begins to form and when it stops growing. "This is a fascinating example of what we call 'tribochemistry,'" Carpick said. "The combination of friction and mechanical pressure enhances the probability of chemical reactions by reducing the energy needed to break or form bonds. In this case, it helps break down the ZDDP molecules and also helps them react to form the tribofilm on the surface. And when the pressure drops, the film growth stops as needed." The study provides a way forward for scientifically testing new anti-wear additives. Being able to pinpoint the level of stress at which they begin to break down and form tribofilms allows researchers to compare various properties in a more rigorous fashion. "Nanotechnology's not just for doing cool science," Gosvami said. "You can bring your industrial products into the lab and we can do research on them in a big way. We can get a better understanding of them on the molecular scale." "We think the methods we've developed here can be applied even further," Carpick said. "Ultimately we hope this will help us to rationally design even smarter engine oils; there's a lot of opportunity to improve fuel economy in vehicles, but the scientific understanding of how all the additives work is still in development. So the challenge now is to put this new knowledge to good use."